May. 4, 2013 12:00 p.m.
Two of the three Founders of Girls Guides in Leduc. Mrs. Em Taylor on the left, and it is believed to be Mrs. Beebe on the right. The Leduc Girl Guides have just marked a big anniversary for their troupe; 50 years old and going strong! A celebration of that fact was held on Saturday April 27th at the Leduc Scout Hall, a space that they share with the Leduc Boy Scouts. Photos and momentos of the troupe over the previous 50 years adorned the walls of the hall, along with many remembered adventures and joys from current and former Girl Guides alike. 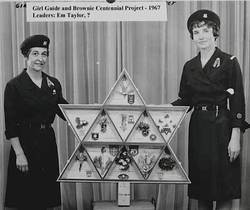 The first Girl Guide meeting in Leduc was held on April 22, 1963, with 18 girls attending and being led by Captain Em Taylor, Mrs. H. Beebe, Mrs. Hurtak and Mrs. H. Hyndman. Since that time over 1,400 adult volunteers have served in Leduc and approximately 8,700 girls have joined and participated as Guides. City Councillor Dana Smith fondly related some stories from her childhood growing up in Guides, and according to Karen Ulmen, Promotional Representative and Brown Owl Leader for the Leduc Guides, "This is what happens in Guides; the memories never end!" The morning began with some quick congratulatory speeches from several local dignitaries, and then a very special presentation was made to Darlene Dunsing, District Commissioner and Leduc Brownie Leader. Karen commented that after 37 years of volunteering with this troupe, Darlene was the "glue that holds us together," and was thrilled to watch as Darlene received her honourary Life Member pin from the Girl Guides of Canada. 100% of the ladies who have committed large portions of their lives to organizing and running the Leduc troupe are volunteers. "We get paid in hugs!" laughed Dana Wagner, Michener Area Commissioner. "When you see the growth in a child from the experiences in Guiding, that is payment enough." All the members of the Prairie Wind District, which is the Leduc troupe, are passionate about the benefits of Guiding in the lives of young women. Always heavily involved in giving back to their community, the Leduc Girl Guides have, since day one, worked toward making Leduc a better place to live. Every year the Guides help with Pitch-In Week cleaning up the garbage around the City, they work with Communities in Bloom to plant the flowers in front of Civic Centre, assist with the Legion's Poppy Campaign, maintain a historical flower garden along 46 St. beside the railroad tracks, and work closely with the Leduc Food Bank during their drives. The Leduc troupe has also won two awards for Best Junior Group in some of the parades held here in town. This is also the first year that the troupe has started a new initiative with the Food Bank by creating a "birthday party in a box". "A troupe in Calgary began this a few years ago and when we heard about it we presented the idea to the girls here and they thought it would be a fabulous project!" said Darlene. "Knowing that struggling families that need the assistance of the food bank probably can't afford to give their kids a birthday party, we decided to help provide that for them. The girls decided what they wanted to put in the boxes, did the shopping, and used their own money that they have earned, not just a hand out from mom and dad!" laughed Darlene, "And they put together large cardboard boxes that hold everything you might need for a birthday party." There are decorations, a cake mix and icing, candles, plastic cutlery, plates and napkins, party favours and even a gift for the birthday child in each box. This year there were three boxes created to be given away through the food bank; one for a boy and two for a girl, and with the great response they received from the Guides themselves when they put them together they hope to continue with this project in the years to come. One young lady, Miss Carla Burge, is just experiencing her first year in Girl Guides as a Brownie, and already sported a sash almost overflowing with badges she has earned. When asked what she likes best about Girl Guides she immediately said "sleepovers!". And when asked which of her badges she was most proud of, she showed off a circle of fabric that had two people standing side by side on it, and she explained that it was her Helping Sparks badge, from when she assisted the really little girls called Sparks, learn a song. Darlene shared that "Part of service is giving of yourself, and this is part of what Guiding teaches girls." The Leduc Girl Guides certainly have certainly lived up to their own motto of "Make a difference in the life of a girl and she will make a GREAT difference in yours!" Here's hoping this vibrant group of young ladies has another successful 50 years ahead of them!